1. Take a bowl and add yogurt and water. Stir well still it smooth. 2. Add turmeric powder, ginger green chili paste, asafoetida and salt and mix well. 3. Add the gram flour with a wired whisk and keep on stirring and mixing until you get a smooth batter. There will be no lumps in the batter. 4. Spread oil in a tray or large steel thalis. 5. In a bowl mix chopped coriander and some amount of grated coconuts and keep it aside. 6. Keep a pan in heat and make it in a low flame. Pour the batter into it. Keep on stirring when the batter is getting heated up. The batter would get thick. Make it thicken and keep on stirring. It is better to use wooden spatula. 7. Do a plate a tesh when the batter will thick properly. 8. Spread a tbsp batter on the side of the greased plate and let it become cool. Then try to make it roll. If you are unable to make the roll then the batter needs to cook more and if it is possible then your batter is ready for making roll. 9. Now, quickly pour the batter in the grease thali and spread it evenly and thinly with your spatula. If there is any batter remaining in your pan, then you need to grease on more thali and have to quickly pour and spread the remaining portion on another thali as cooling of batter may become blob and difficult to spread. 10. Allow to cool and sprinkle the mixture of coriander and coconut over it. You can also skip this part and make this during garnishing. 11. Cut into equal size strips and gently roll each strip tightly. Do the same thing with all the strips and place them in a tray or a plate. 12. Heat oil in a pan and crackle the mustard seeds. 13. Add green chilies, curry leaves and sesame seeds. You can add little water and sugar. However, it is optional. Pour the tempering mixture in the khandvi roll. 14. 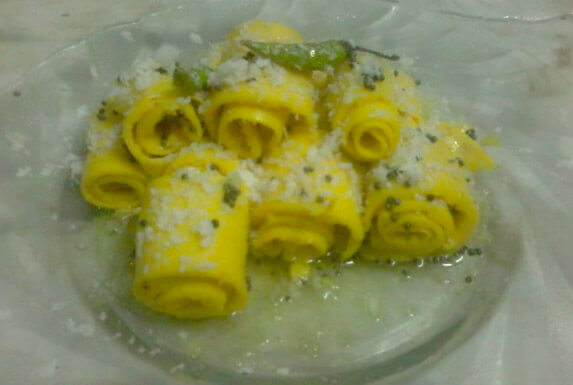 Now you can garnish khandvi with grated coconut and chopped coriander leaves. 15. Your Khandvi is ready. Serve it with coriander chutney.